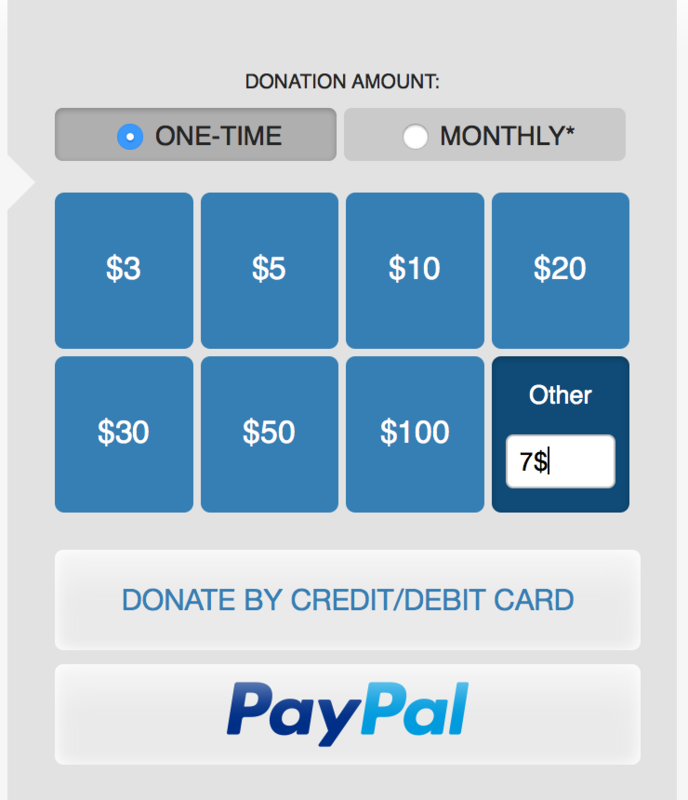 Donors inadvertently entering a currency symbol in the Other amount field get message saying please select an amount, which confuses them. Ideally, we would just strip the symbol on our side before submitting, thereby letting the donor pass through without an error. If that's not possible, let's update this error message to something like please do not enter the currency symbol in the amount field that would be really helpful. We've seen 11 Zendesk tickets related to this in the past 4 days. MBeat33 added subscribers: MBeat33, Ppena. @MBeat33 this is so weird. We never saw this before and had that field there forever. What country is this coming from? Maybe we should change something in the banner or the way we present the information instead? Yes, this is odd. We've been using forms like this for a long time now (both in banners and donatewiki), and nothing has changed about them recently. I'll take a look how we can improve it though. @Pcoombe could we put a currency symbol just to the left of the text entry box? We should also be able to deal with this on our side with validation. Adding to the next sprint for the time being. atgo moved this task from Analysis to Sprint +1 on the Fundraising-Backlog board. atgo triaged this task as Normal priority. Not sure why, but the volume of this is much higher than normal. A comment I've seen from multiple donors is "The fixed donation amounts had a $ sign in from of each of them. Therefore when I typed in my own amount, I thought that I had to put a $ sign in." Okay, solved. 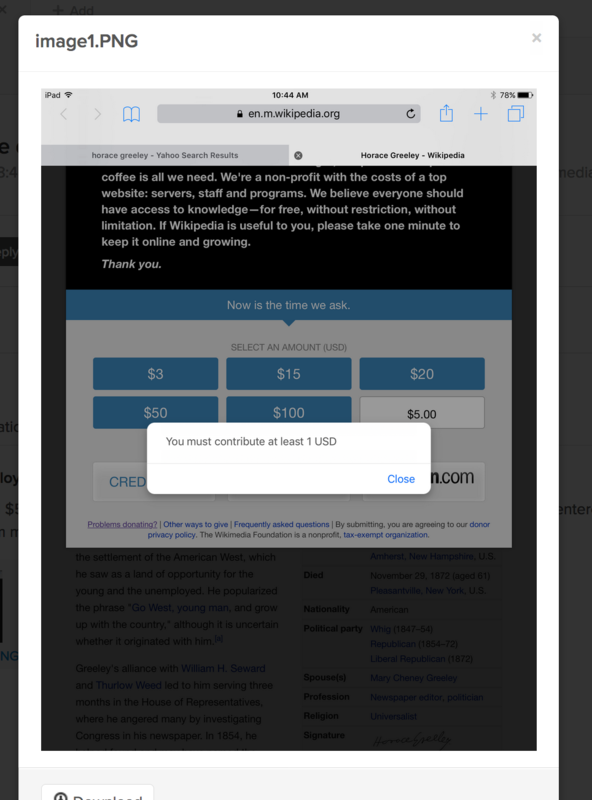 We never had the code to strip out currency symbols in donatewiki that we had in banners. I've added it to make them both the same. I guess the increase in volume is just because we've been sending many emails recently. @Pcoombe that's great, many thanks. 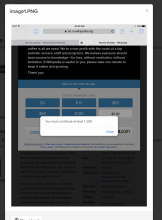 Three major donors who've received the recent enMG15 bulk email have reported this problem occurring; the donor in the screenshot said it occurred on their iPad but not a desktop. ZD #s 188299, 188260, 187559 can we confirm that this fix has been applied to all mobile forms? This seems to be working again now. @Pcoombe is this an fr-tech task now? DStrine moved this task from Sprint +2 to Sprint +3 on the Fundraising-Backlog board. 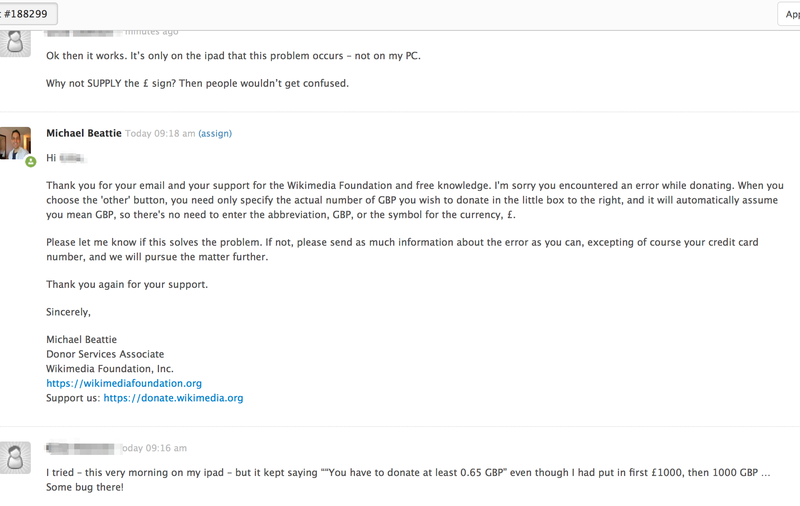 Pcoombe moved this task from Inbox to Banner issues on the Wikimedia-Fundraising board. @Pcoombe / @Jseddon this looks like it's in a banner - do you add that $, or did the donor type it? Would that mess with the amount logic? Oops, just saw all the comments above. Guess this is a well understood issue! This was due to particularly annoying Safari behaviour. When <input type="number"> is used, on mobile it will display a keyboard with symbols including $, and allow them to be typed. However once the input loses focus (e.g. 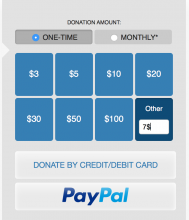 when the user clicks a payment method) it will think "Hey, that isn't a number!" and blank the entire field. So our own validation then fails. It is possible to get a keyboard with only numbers by applying a certain pattern attribute, but that makes it impossible to input decimal points.